(Nanowerk News) A new study predicts that researchers could use spiraling pulses of laser light to change the nature of graphene, turning it from a metal into an insulator and giving it other peculiar properties that might be used to encode information. 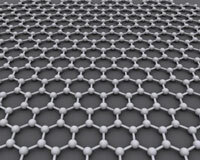 This illustration depicts the structure of graphene, which consists of a single layer of carbon atoms arranged in a honeycomb pattern. The results, published May 11 in Nature Communications ("Theory of Floquet band formation and local pseudospin textures in pump-probe photoemission of graphene"), pave the way for experiments that create and control new states of matter with this specialized form of light, with potential applications in computing and other areas.